Avoid busy patterns and bright colors. Light colors are best with fair complexions. Darker colors look better with dark hair or complexions. With only two subjects in the portrait, it is especially important to dress in Your favorite clothes and colors. That would help to capture your relationship and Your personality. It is also important to have a hair done. You can have them done professionally or do it Yourself but make sure your hair looks nice. Make-up is also very important. It should be slightly heavier than normal, however, don’t overdo it. A translucent powder can be helpful to eliminate shine, especially for oily skin. 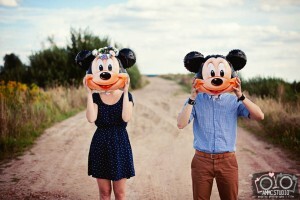 Most importantly, couple should maintain an energetic attitude: smile, smile, smile and relaxed during the photo shoot . Couple have to be comfortable during the shoot because the tension will show during a photo shoot. It is important to have fun as much as possible. Before the engagement session we would like to know a little more about Your and Yours fiance’s expectations. That would help us to prepare for the session with You. We would like to know what would be a favorite theme of Your session? Vintage engagement session or maybe modern colorful session. If You have any pets, and would like to bring Your pet to the session feel free to let us know. Do You like flowers, what king of flowers? We really would like to use some small props that reflect You and Your personality. Do You have favorite hat, sunglasses, etc? During Your session we will visit few places, so if You would like to bring few outfits, feel free to do so! We really love girly dresses and high hills. Attention guys: NO BAGGY CLOTHES !!! Pinterest is your best friend! If you are looking for outfit inspiration ideas that is the place to look for it!